The acrylics are laid on a wooden table with monochromatic perfection. A blank canvass waits to be explored. Water droplets glisten as they leave the auburn bristles of the brush. A flurry of horizontal strokes awakens the sordid paleness. A dash of vertical Prussian blue collides with wavy ochre. Vermillion over emerald. Sienna peeping through the cobalt notes. The brushes fall and fingers reign the dyed paper. The fingers run wild, flooding the whiteness like an angry rainbow across the empty sky. The sanctity of the easel lost to the festering colours. The tinted viscosity blurs the didactic depiction normalizing irrationality between the artist and the portrait. Consuming art. Consuming love.Basho writes :- The temple bell stops. But the sound keeps coming out of the flowers.Isn't the consciousness of love like these temple bells? Long after its physicality ends, the essence lingers through budding emotions within the delicate sounds of the past. How is it to experience a love so abstract that death seems a friendly stranger? Ueno Otoko, loving a man who stole her childhood, delineates the purity of an overwhelming emotion –love and not clemency. Otoko lost her baby during a painful childbirth; a tearful goodbye with only the memory of her child’s pristine black hair. 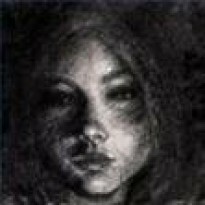 Otoko was 16, when she overdosed on sleeping pills after her baby’s death; a bid to escape the encumbering deficient love. As a solitary blossom among the sea of stones, Otoko bloomed amid the darkness of a distorted love perplexed at her long survival. The colours in her portraits were tales of Otoko’s poignant heart ; the brush strokes searched her child’s face. "She had no idea of the face and form of her baby, only a vision in her heart. She knew very well that the child in her. Ascension of an Infant would not look like her dead baby, and she had no wish to paint a realistic portrait. What she wanted was to express her sense of loss, her grief and affection for someone she had never seen. She had cherished that desire so long that the image of the dead infant had become a symbol of yearning to her. She thought of it whenever she felt sad. Also the picture was to symbolize herself surviving all these years, as well as the beauty and sadness of her love for Oki. "In a Girl of Sixteen, Oki immortalized the woman he considered his only passionate love. A woman who at a tender age of 15 lost her virginity to a much married man in his 30s. Kawabata delineates Oki as a man lost in egocentric love; even though ridden by guilt of blemishing Otoko’s youth, Oki pursued the forbidden tenderness as though the inherent madness of it all kept him alive. "It was the tragic love story of a very young girl and a man himself still young but with a wife and child: only the beauty of it had been heightened, to the point that it was unmarred by any moral questioning. "The stillness of his memories kept Otoko alive through his writings and the ringing of New Year’s bells in Kyoto with each passing year. "What were memories? What was the past that he remembered so clearly?..............he could not escape the pain of having spoiled her life, possible of having robbed her of every chance for happiness.......the vividness of the memories mean that she was separated separated from him...."From flaunting his affairs to Fumiko to consciously leaving his wife out of the memoirs for an untainted tale of intricate passionate love and earning his generous royalties from the book; Oki is an outright amoral man. 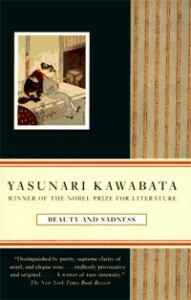 Kawabata gives a picture of a reckless man imparting ugliness through beautiful sentiments. In the autumn of his life how could he hope for forgiveness from a woman who lived his aberrant repercussions?Keiko on the other hand is a misguided passionate lover. One could say her love for Otoko was mere teenage infatuation, but her determination in seeking revenge from Oki throws a different light on Keiko’s commitment to Otoko. Kawabata underplays homosexuality limiting Keiko’s relationship with her teacher (Otoko) only to the idea of revenge. It may be due to Otoko resisting of letting go her past ghosts spinning a web of jealousy for Keiko. Or Kawabata hesitated in exploring a lesbian love due to cultural restraints. "Otoko still loved Oki, her baby, and her mother, but could these loves have gone unchanged from the time when they were a tangible reality to her? Could not something of these very loves have been subtly transformed into self-love?Of course she would not be aware of it. She had been parted from her baby and her mother by death, and from Oki by a final separation, and these three still lived within her. Yet Otoko alone gave them this life. Her image of Oki flowed along with her through time, and perhaps her memories of their love affair had been dyed by the color of her love for herself, had even been transformed. It had never occurred to her that bygone memories are merely phantoms and apparitions. Perhaps it was to be expected that a woman who had lived alone for two decades without love or marriage should indulge herself in memories of a sad love, and that her indulgence should take on the color of self-love. "Keiko- Otoko’s protégée and a jealous lover avenged Otoko’s melancholy through the malicious play of her physical splendor consuming Taichiro in her seduction. Fumiko whose love was loyal and simple towards Oki, yet appallingly as she prospered in Otoko’s printed exhibition. Otoko who still loved Oki, her mother and her baby and never let go of her 16 yr old from her soul, the very reason of her being hesitant in sketching Keiko somehow seem to be her teenage apparition. And, Oki who could never distinguish nostalgic remorse from factual remorse. Akin to the moss covered roof at the restaurant that never had the chance to dry out because being weighed down by the huge tree, all of Kawabata’s characters were stuck in time buried under the obscurity of memories and prejudices"Time passed. But time flows in many streams. Like a river, an inner stream of time will flow rapidly at some place and sluggishly at others or perhaps even strand hopelessly stagnant. Cosmic time is the same for everyone, but human time differs with each person. Time flows in the same was for all human beings, every human being flows through time in a different way. "Issa writes:- Cherry blossoms in evening. Ah well, today also belongs to the past.Love is narcissistic, deviant, vengeful, powerful and yet somehow beautiful. It breathes life into one’s solitude only to revel in the silence of emptiness,. Happiness is transient and it is in sadness that tranquil loveliness bloom like a white lotus on fire. Beauty encompasses sadness through a spate of sorrows and death; the fleeting exquisiteness of cherry blossom that eventually meets the earthly grave.